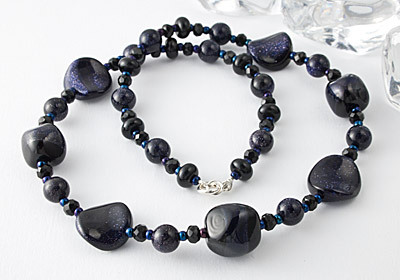 A stunning blue goldstone gemstone necklace that has tiny pinpoint sparkles as the light catches it. With matching hand made focal beads in black with a blue goldstone stripe around the centre, black spacer beads, faceted fire-polished glass and metallic blue glass seed beads. Finished with a sterling silver clasp.